I have always really liked the clothes from here. By the time I found time to pop into the boutique however, I had already accumulated a stash of clothes for Bubbles - courtesy of generous family and friends, several hand-me-downs, and my mini shopping sprees. So I did the wise thing, and decided since then not to buy any more clothes for Bubbles. Still, I got a thrill when I received this present, passed to Roboman during his recent trip up to KL. I think it could be an outfit Bubbles wears for her full-month celebrations, or Christmas, depending on how she grows! 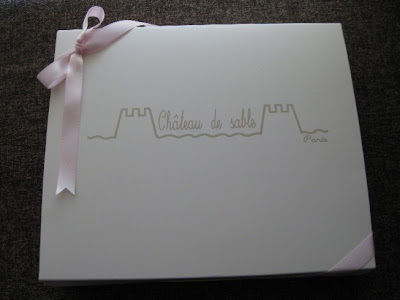 i got some chateau clothes too! it's so cute! Oh so that is what it is called! A play gym! hehe. Thanks for the offer, I really don't mind taking over a pinky play gym :) Thanks so much. Will drop you a mail. Looks like it is quite popular! Very classic designs. wow you've acquired more practical stuff then me! i've yet to buy a playmat and highchair! toys, also not much.. quite simple to entertain her actually for now..
and yes, i like chateau stuff too, but the material is really hard to iron! which is annoying becos u expect baby clothes to be crumple free since they're lying down half the time..
No no, I haven't gotten all those yet! Spreading out the spending till later. We just received a hand-me-down highchair though :) Eep about ironing. And I can imagine baby's clothes harder to iron as they are so tiny! As for books, anything goes!As long as there's colours! And better if there are sounds/flaps etc for them to play around.